The Oppo A53m and A33m have both received their 3C certification in China. The A33m has also been certified in the country by TENAA, which means that this model could be unveiled shortly by the manufacturer. The A33m is not a high-end model by any stretch of the imagination. Sure, it features a 5-inch screen, but that seems to be the floor these days for Android models. The resolution of the screen is 540 x 960 (qHD). 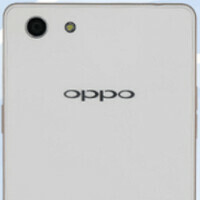 A quad-core 1.2GHz CPU powers the handset, which has 1GB of RAM inside, along with 16GB of expandable internal storage. The Oppo A33m offers an 8MP rear camera, with a 5MP snapper in front for selfies and video chats. A 2400mAh battery keeps the lights on, and Android 5.1.1 is pre-installed. The unit supports 4G connectivity, and will be offered to consumers in a gold color priced at under $150 USD. Unfortunately, there aren't any rumored specs floating around the for the Oppo A53m. We might have to wait for that phone to clear TENAA before we have some info to pass along on that device. We do expect, judging from the model number, that the A53m will offer higher specs than the Oppo A33m. The CCC certification means that the phones can carry the "CCC" safety mark, which is required on products made in China, and imported into the country.